Teralba’s new Dimplestream heat exchanger. TERALBA Industries has released a new range of 'Dimplestream' multi-annular tube heat exchangers, complete with integrated stainless steel clad thermal insulation. The new insulated heat exchangers build on the virtues of the Dimplestream system by increasing efficiency through the minimisation of energy losses, from heating or cooling media, in the outer annulars of the tube bundle. Australian made dimpled tube heat exchangers have been utilised to efficiently and effectively recover energy from hot waste effluents and heat sewerage sludge for anaerobic digesters. The stainless steel cladding provides a hygienic, aesthetically pleasing finish to the Dimplestream heat transfer system. The design of the stainless steel cabinet ensures the closing head of each tube bundle is accessible, enabling visual inspection of the integrated 0-ring leak detection system, and maintenance. 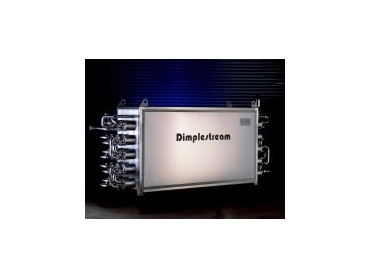 Dimplestream’s ability to process sauces, soups, wastewater and slurried products, which contain pulp and particulates, whilst still achieving heat transfer coefficients similar to a plate heat exchanger, has resulted in these heat exchangers being utilised in wastewater, food, chemical, beverage and industrial applications throughout Australia.